Birth date and place 1820-1847 Carrick-on-Suir, Tipperary, Ireland (not verified). 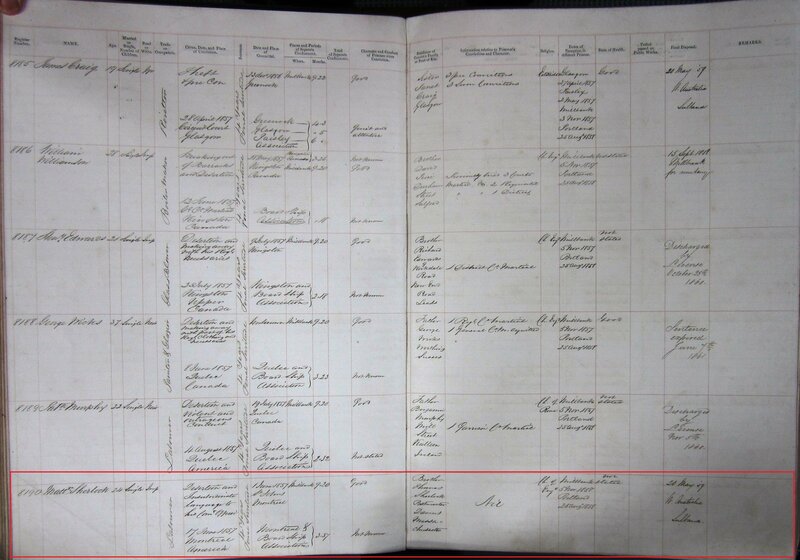 Note: birth dates vary depending on sources: newspapers, prison records, marriage certificates etc. Physical Description Height: 5 ft. 9³/8 ins. Complexion: freckled. Eyes: grey. Hair: red. Face: round. Build: middling stout. Marks or Scars: Letter D on left breast. 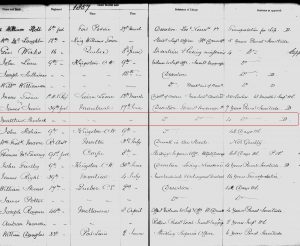 Marriage date and place 13 Aug 1877 Marrabel, Gilbert District, South Australia. Name variation: WILLCOX, WILCOCK(S), WILLCOCK(S). Children Annie b. 1875, Marrabel, Gilbert, South Australia (source: marriage certificate). James b. 1877 (d.1875), Marrabel, Gilbert, South Australia. Matthew b. 1879, Marrabel, Gilbert, South Australia. Henry b. 1880, Marrabel, Gilbert, South Australia. Thomas b. 1883, Tothills Creek, Gilbert, South Australia. Sarah b. 1885, Tothills Creek, Gilbert, South Australia. Mary b. 1889, Tothills Creek, Gilbert, South Australia. Hannah b. 1891, Tothills Creek, Gilbert, South Australia. William James b. 1894, Tothills Creek, Gilbert, South Australia. John b. 1896, Tothills Creek, Kapunda, South Australia. James b. 1899 (d.1899), Tothills Creek, Kapunda, South Australia. Agnes b. 1901, Tothills Creek, Kapunda, South Australia. 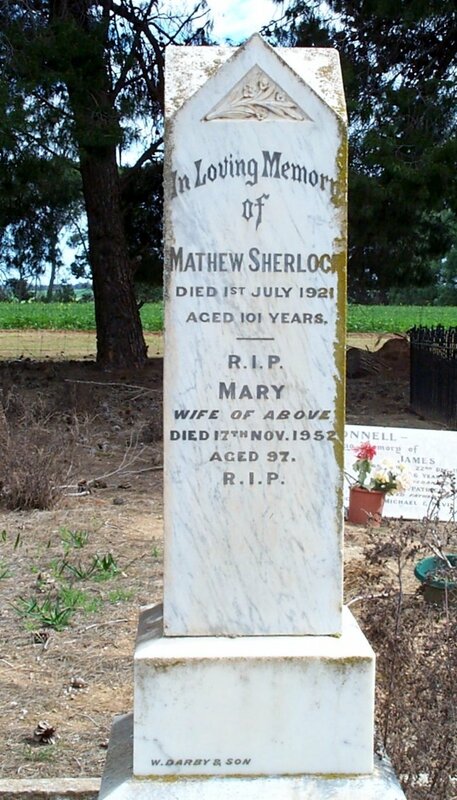 Death date and place 1 Jul 1921 Navan, Gilbert District, South Australia. Burial date and place July 1921 Navan Catholic Cemetery, Riverton, South Australia. Regiment No. and Rank #3454 Private. 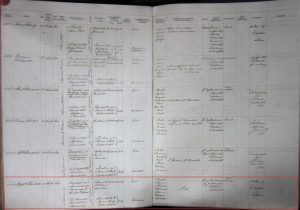 Attestation date and place Before December 1843. 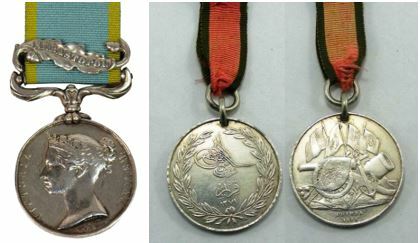 Medals, Clasps and Badges Gwalior Star (Maharajpoor). General Courts Martial 17 Jun 1857 Montreal, Canada. Sentence Four years penal servitude. Prison and Register # St John’s, Montreal Garrison, 3 months 19 days. On Board Ship 18 days. Millbank Prison #5907, 9 months 20 days. 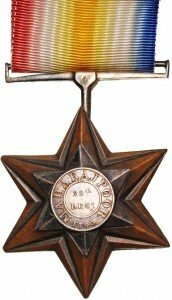 5 Nov 1857 to 28 Aug 1858. 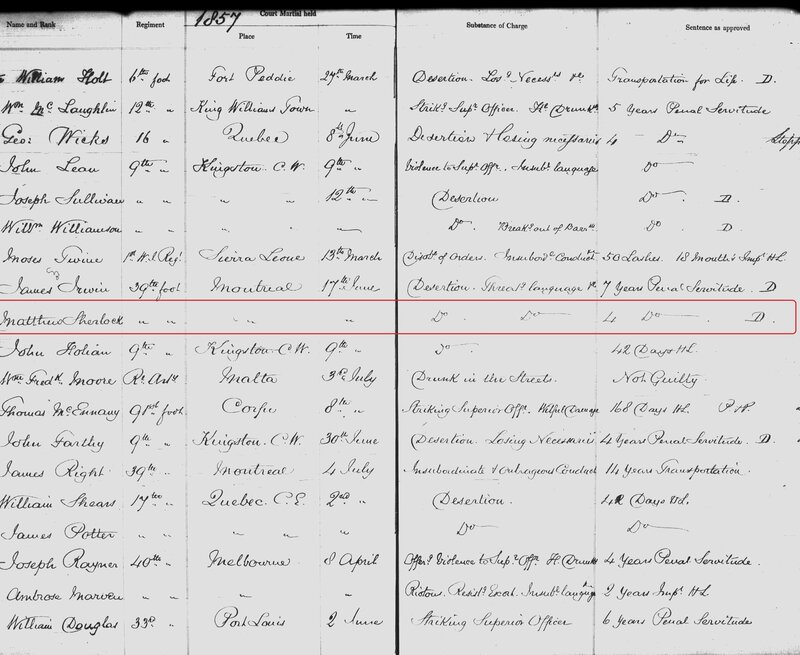 Portland Prison #8190 from 28 Aug 1858 to 20 May 1859. 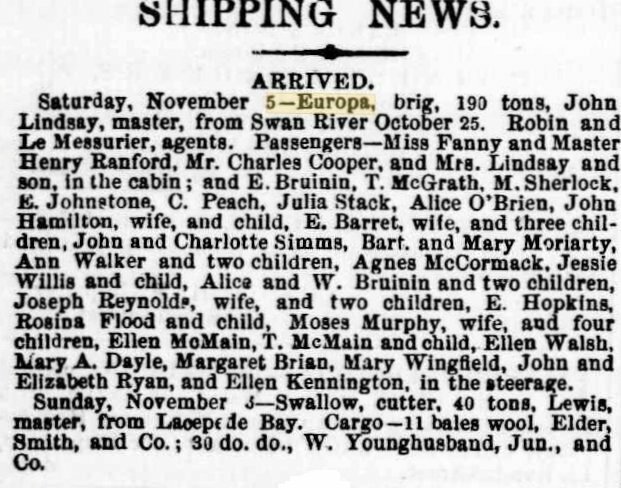 On Board Convict Ship Sultana, embarked 20 May 1859 (see below). Post Discharge Residence Montreal, Canada. Departure and Arrival 29 May 1859 Plymouth; 19 Aug 1859 Fremantle. .
Prison and Register # Fremantle Prison #5445. WA Ticket of Leave 12 Jan 1860. WA Conditional Pardon 9 Apr 1861. Misc. Newspaper Articles Perth Gazette 28 Oct 1864. 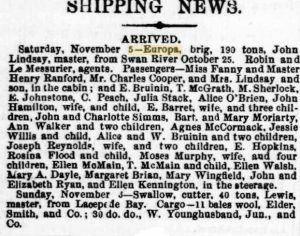 Adelaide Express 7 Nov 1864. 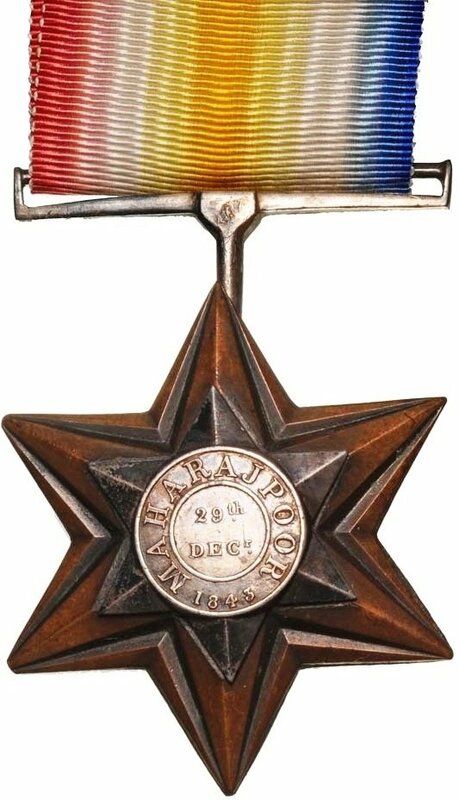 28 Oct 1864 dep. Fremantle; 5 Nov 1864 arr. Adelaide, South Australia.